An iron horseshoe is believed to have magical powers to expel evil. Nobody says "no" to a good luck charm. 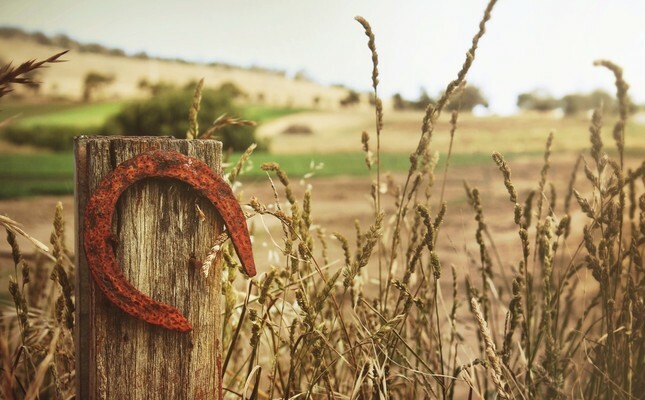 And the most common good luck charm found in almost every culture is the horseshoe, with many people thinking that hanging a horseshoe over a door brings good luck. The belief in the magical powers of horseshoes has roots both in the ancient Greeks and Christianity. The Greeks believed that iron could cast off evil and that a horseshoe resembles a crescent, which they considered a symbol of fertility and good luck. Early Christians adopted this pagan belief and turned a horseshoe into a talisman to protect them from evil, witchcraft and the devil himself. In the British Isles, on the other hand, the horseshoe and its magical powers are related to the legend of St. Dunstan: Dunstan was a simple man, a blacksmith, in 10th century Britain. One night, the devil paid him a visit and asked him to put a horseshoe on his horse. Instead of putting the shoe on the horse, Dunstan nailed the horseshoe to the devil. In pain, the devil begged Dunstan to remove the horseshoe; however, Dunstan agreed but under one condition. The Devil had to promise to stay away from all houses with a horseshoe above their entrances. Thus, Dunstan became the Archbishop of Canterbury and was elevated to sainthood. Although the belief that a horseshoe had magical powers was transferred from pagan Greeks to Christianity, it has traces in other cultures as well. In Ireland a bride used to bring a real horseshoe to her wedding for good luck. Greeks still use the horseshoe in their weddings to bring the couple good luck and lots of children. According to a Croatian belief, a horseshoe is put above a bed to keep those sleeping safe from nightmares.